To celebrate 30 years since the film hit theaters, customers with Android devices running Android 2.1 or higher will soon be able to get the Empire Strikes Back app from Android Market. The app, only for Verizon Wireless customers, allows Jedi Masters to browse, preview and download Star Wars content related to Star Wars: Episode V The Empire Strikes Back. Verizon Wireless customers can access premium Star Wars content for a one-time charge of $2.99. 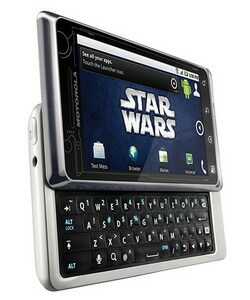 Motorola DROID R2-D2 will be available for $249 after a $100 mail-in rebate with a new two-year customer agreement. Customers will need to subscribe to a Nationwide Talk plan or a Nationwide Talk & Text plan (beginning at $39.99 monthly access) and an Email and Web for Smartphone plan (beginning at $29.99 for unlimited monthly access). Customers will receive the rebate in the form of a debit card; upon receipt, customers may use the card as cash anywhere debit cards are accepted. For more information on Motorola DROID R2-D2, go to www.droiddoes.com/r2d2. 0 comments on "Motorola DROID R2-D2 Limited Edition lands on Verizon"